I had no idea this book was a “case”. I thought, honestly and without any vanity whatsoever, that it was one of those lousy books that I seem to find and appreciate on my own (not because I’m a special snowflake, but because I have funny tastes). Anyway, since I wanted to talk to you about this anyway and since it seems to be very appreciated, here I am giving you my opinion. And we could wrap it at this, but since it’s some sort of “manual”, maybe it’s worth to dig a little deeper. I bought it by chance, at the supermarket, mainly because it said “japanese” on the cover. There is something in the tidyiness, in the calm, in the grace and the *zen* of Japan that I’ve always been drawn to. Then it’s no mistery that I’ve already dealt with downshifting and attempts to tidying up. Did those add up to something? Nope, my desk is still a clutterboard. Did I already practice Marie Kondo’s method? Neiher, I’m a pool of lazy and procrastination. Then what did I like about the book? Two main things: the style above all. I don’t know if you had your fair share of japanese authors, but every time I read one, I seem to find the same calm, order, zen grace I love. Think of an anime or a manga, a good one, where there are maybe five minutes of frames of flowers and light glistening on water, or empty silent streets. To us westerners these have no reason to be, not “for the plot”. But I think that’s the point: we’re to keen on “bringing the plot forward”, moving things restlessly, while I feel, there, an innate love for standing still and observing. Leaving the prose aside, the second thing I liked is the approach the author has to tidying up. Beyond downshifting and decluttering that simply go “Get rid of anything you do not truly need and you haven’t been using in the past 12 months”, or the “organizing solutions” that prescribe a place for anything, perfectly packed and stacked in wardrobes or shelves. Making them beautiful to look at, but impossible to use. “Get rid of anything that doesn’t make you feel anything”. Why? Because I do not want to toss that sundress (with a pretty colourful Betty Boops on it) I had when I was two, even if I can no longer wear it as a tank top, I don’t know why, I don’t even remember when I wore it as a child, but every time I see it, I smile. Nor I want to toss that dress, not exactly pretty, but that makes me feel like wonderwoman, even if I only wear it half an hour, at home, before deciding to change into something else before going out. I rather toss three more tshirts, a dress and two skirts that I have lingering there, that I do not use and that don’t make me feel anything, than these two pieces that make me emotional. I don’t know if this is of any use to you, but with me… it clicked. I’m also fascinated by the lingering animism, I don’t think I’ll ever thank out loud my jacket for keeping me warm, but I have said a couple of times “Hello home” when coming home tired or after a journey. I think respect for your objects can make sense: you bought it therefore you deserved it through your work, it’s a way like any other to be grateful for what you have, and also for what you do. So maybe this can make you more grateful, daily, for your life. There, maybe this is the point, downshifting is surely useful, but to me it is still too “cold”, like it’s guilt tripping everyone, like any object whatsoever is evil. Yet the value of a warm pair of fuzzy socks in a cold winter day, is priceless, and being aware of thet surely doesn’t change your life, but it can change your day, if you add in that the socks had been knitted by your grandma and they make you feel cuddled every time you wear them… I don’t know, do we really need to discuss this further? There, go get this book, borrow it, find it in your local library, because there are practical advices (I am willing to try them, I promise). Basically, I think it’s worth it. Certo!!!! 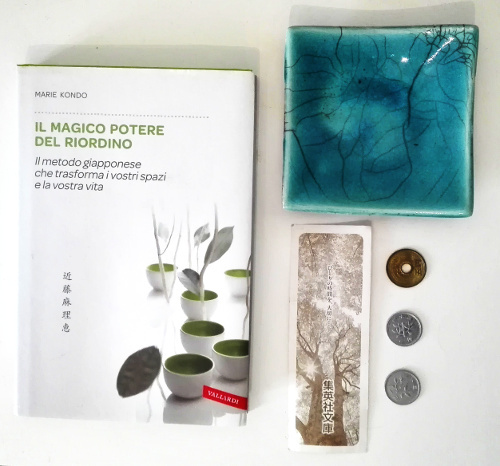 Ma soprattutto, speriamo torni utile il metodo!! !